This week's Free GM Resource kind of took me by surprise. I already have affiliate links for DriveThruRPG, that get me the FrugalGM some brownie points (that may or may not be in the form of store credit at no cost to you by the way) when you use that link to shop at the webstore, but this isn't a pitch for you to spend money at DriveThruRPG. 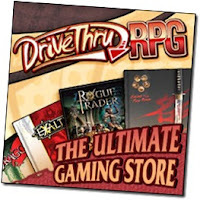 This is a pitch to get you free stuff at DriveThruRPG. I knew there were free items on that site.....heck, I placed some there, but I hadn't really noticed that you can actually browse the selection of free offerings. In retrospect that was probably just an over-site on my part because the site makes it kind of easy to know where to go. If you look at the left menu bar and scroll down (if needed) to the bottom you'll find a little graphic marked "FREE STUFF!". How hard could it be not to notice that, right? I figured it was just a certain something available for download, but in fact it is a quick-link to everything on the site that is free. All 2718 items as of the time of this posting. 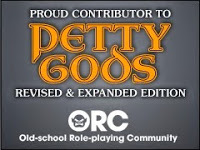 I'm sure there is a lot of stuff on there you wouldn't care to use, but there are also a ton of gems in there and a free offering is a good way to see if you like a particular publisher's work.